A discussion forum is an online asynchronous communication board, where a user can read or add messages for various communities of practice. The forum feature allows online communication in an LMS and messages can be posted or read by anyone at anytime. What is the user’s role? How should one behave while interacting with their peers? Who will be given access to the thread? Can they start their own discussion by creating a new post? Initiate: Initiate the discussion by posting a question, a thought, or an idea, then let them take over. Intervene if the users deviate from the topic, but give your learners the opportunity to share their skills and insights with each other. Encourage users to collaborate with their peers. Create smaller groups: Because everyone is different, it is critical to understand their psychology. Some may be reluctant to share their thoughts and experiences in a public forum. As a best practice, one may divide the class into smaller groups and only allow members of the group to see the thread. Again, if you see that specific learners are still not interacting with their peers on the forum, then you can reach out to them privately and address their concerns. Create a schedule: It is critical to creating a schedule for the users to be able to effectively use the forum. For example, ask them to create at least one post by every Sunday. Provide ample time to post and give a virtual nudge to those who haven’t posted by the scheduled time. Provide the schedule in advance so that it does not come as a last-minute surprise! 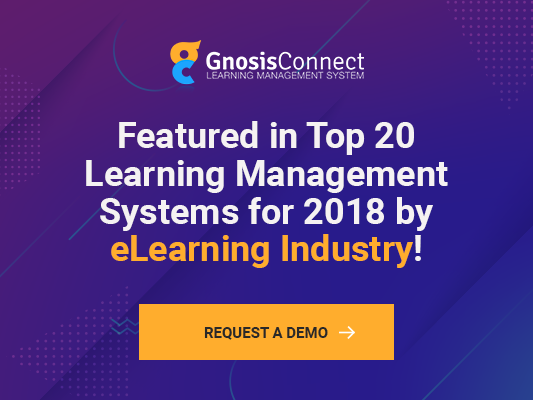 If you’re looking for a forum/social learning enabled Learning Management System for your company, take a look at our LMS, GnosisConnect. We even have a free trial so you can try it out and see how it fits your needs. Mridusmita is a learning & development specialist with over 12 years of experience in instructional design and writing. Her experience involves needs analysis, and designing learning solutions for different segments such as K-12, higher education, and corporates. She is a constant learner. Her core competency is managing multi-functional and multi-cultural teams that are geographically spread. She loves to cook and spend time with her toddler when not at work. Copyright © 2019 GnosisConnect. All rights reserved. What is your Hosting cost? How much does your Monthly support cost? The value under "Your LMS"
For 1,000+ users we do a custom quote, as a business of your size has special needs and requirements. We will be happy to get a custom quote for you.